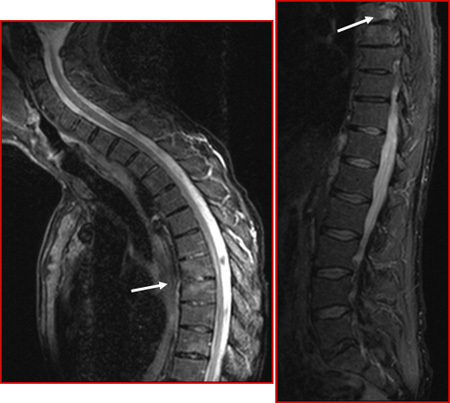 Magnetic resonance imaging (MRI) can often give valuable information in the early stage of spinal involvement. It can also provide information to be used for monitoring therapy. MRI can provide evidence of active inflammation, which cannot be seen in other ways, in addition to chronic structural changes. Typical MR changes in ankylosing spondylitis depend on the disease stage. Early stage: Signs of disease activity in the form of oedema and/or contrast enhancement usually localised to the vertebral corners at the transition between the thoracic and lumbar spine or at the joints between thoracic vertebral bodies and the ribs (costovertebral joints). Middle stage: Often a mixture of signs indicating activity as in early stages and chronic changes in the form of fatty deposition in the bone marrow beneath the vertebral plates, sometimes accompanied by new bone formation between vertebral bodies. Late stage: More pronounced, chronic changes with partial or complete fusion of the vertebral bodies. During active phases there are concomitant regions showing signs of disease activity. 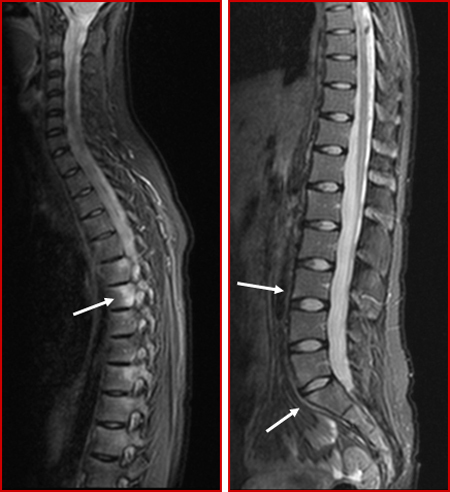 MRI shows mild oedema and contrast enhancement at vertebral corners as evidence of active changes (arrows). 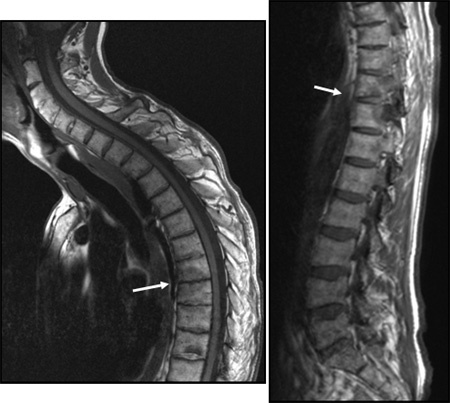 Sagittal STIR images of the whole spine showing signs of disease activity postero-laterally in thoracic vertebral bodies and anteriorly in lumbar vertebral bodies (arrows). These are typical localisations of changes as part of ankylosing spondylitis. Axial T1 FS images after intravenous Gd. contrast corresponding to the inflammation in the thoracic region showing enhancement in the region of left-sided costo-vertebral joints (arrows) as a sign of active inflammation in these joints. 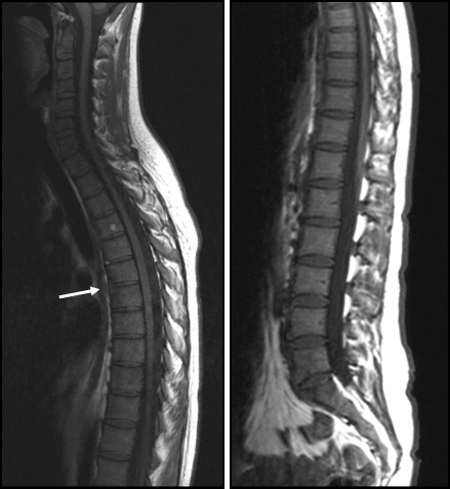 Sagittal T1-weighted images of the whole spine shos slight, chronic changes in the form of displacement of the normal fatty bone marrow anteriorly at two vertebral corners (arrow), but no fatty deposition. 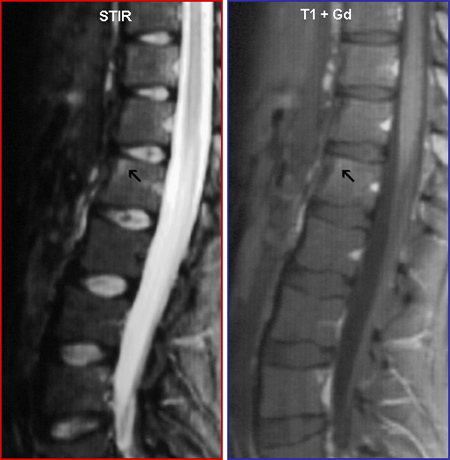 Sagittal T1-weighted images of the whole spine shows scattered fatty deposition at vertebral corners as a sign of sequels after inflammation (arrows). 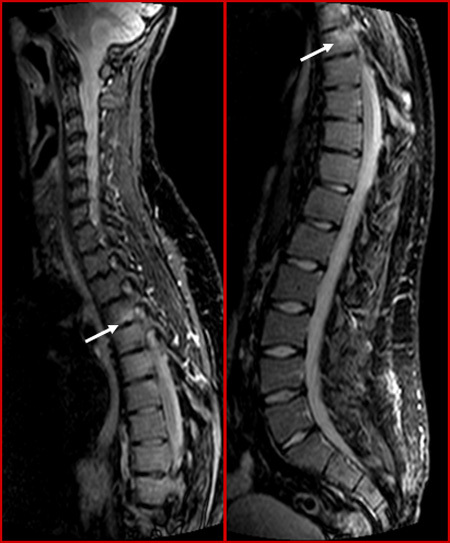 Sagittal STIR images of the whole spine showing signs of mild disease activity posteriorly in the thoracic spine and around a vertebral disk (arrows). 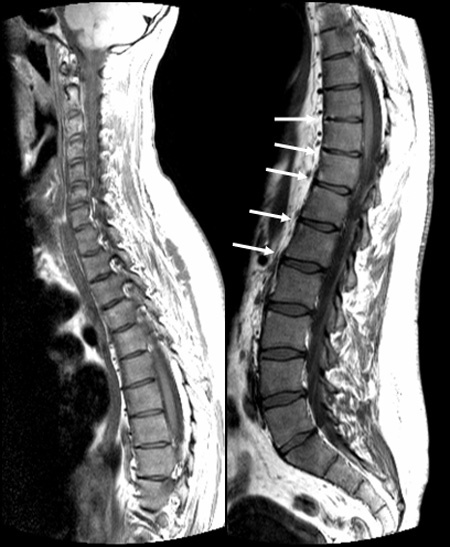 Sagittal T1-weighted images show chronic changes with partial fusion of the neck and lower thoracic vertebral bodies, and bridging new bone formation anterior to several discs (syndesmophyte formation)(arrows). There is an increased curvature (deformation) corresponding to the thoracic spine region.